Display Joomla content arranged in a beautiful and dynamic showcase. Create a beautiful dynamic showcase with Joomla content and reduce the bounce rate on your website by showing to visitors the featured content. You can create responsive grid with Joomla articles, a Joomla slideshow, a Joomla timeline, a Joomla tag cloud, a Joomla masonry layout. The choice is yours! You can place the featured content in any module position available in your template to help users to find immediately what they are looking for. With just few clicks, you can set up Digi Showcase to organize Joomla articles or other contents, styled in a professional way. If Joomla articles are not enough, you can expand Digi Showcase with its Expansion Packs, to use other third-party components as data source. 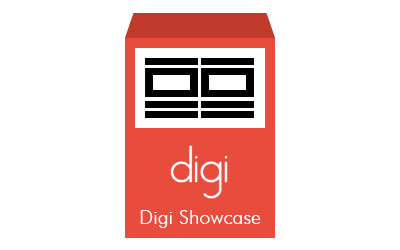 Digi Showcase is simple and intuitive, has a responsive design, is visible on all devices and is compatible with touch devices. With the new wizard, you can get the result you want with just one click. Choose how you want to set up the module and click on the desired configuration button. The module will be set up automatically without the need to move a finger and you can instantly see the new configuration in the frontend. A content filter is available in Digi Showcase, so the guests have the ability to filter which items to view with just one click. In each mode, you have a lot of options for style and layout to set up the content displayed in the module. You can choose whether to display the article intro image, the article image, or the first image of the articles content. Or you can let Digi Showcase to choose smartly which image to show. In case you have not yet set the images in the articles, you will be able to see the behavior of the images in the module through the convenient placeholder function that will show a default image when the article doesn't have the image set. Set the position of the title, description, category, read more button. Show the item creation date above or below the image. Set the background color of the articles, or if you want, set a background image or use the image of each article. Use Joomla Articles, Joomla Categories, Joomla Tags or a Custom CSV as data sources to populate the module. And if that is not enough, you can expand Digi Showcase by using its Expansion Packs plugins to load other data sources. Standard mode: arrange the content in a table responsive Joomla where you can vary rows and columns. Carousel mode: useful for creating a slideshow with Joomla using the content of your choice. Timeline mode: arrange the content in an animated and responsive Joomla timeline. Tag Cloud Mode: arrange the content in a Joomla cloud tag that moves when the mouse hovers. Masonry mode: arrange content in a masonry layout Joomla with defined or random dimensions. Use custom text in CSV format as data source to show the content as you wish, properly formatted, in the module. A expressly created special window next to the text area, can help you to format the content correctly in CSV format, suggesting which data you have to enter. The useful backup function allows you, with a single click, to save the current module settings in a file. You can load the settings in each saved file whenever you want. In this way you can always recover the old settings when you need them. You can then delete files that are no longer needed. To install Digi Showcase, go to under Joomla! extensions manager, choose to upload a package file and select Digi Showcase package file (mod_digi_showcase.zip).